Cambodia is slowly recovering from the horrors of the Khmer Rouge’s reign of terror. Major problems still exist: land mines, poverty and a devastated infrastructure. 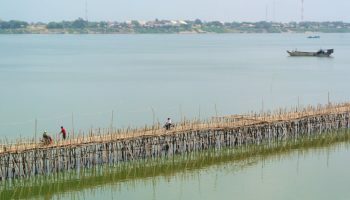 But the reconstruction and healing process is now well under way and increasing numbers of tourists are rediscovering Cambodia’s attractions. 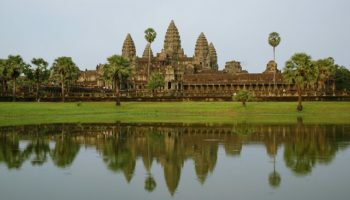 The stunning temples of Angkor are the obvious draw for most tourists, but the country has much else to offer: tropical beaches, colonial buildings and an abundance of natural attractions. 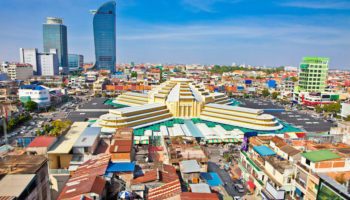 Here’s a look at the top tourist attractions in Cambodia. Although officially part of the Angkor complex, Banteay Srei lies 25 km (15 miles) north-east of the main group of temples, and therefore often considered a separate Cambodia attraction. The temple was completed in 967 AD and is built largely of red sandstone, a medium that lends itself to the elaborate decorative wall carvings which are still clearly visible today. Banteay Srei is the only major temple at Angkor not built for a king, instead it was constructed by one of king Rajendravarman’s counselors, Yajnyavahara. Part of the world famous destination of Angkor, the Bayon temple features a sea of over 200 massive stone faces looking in all direction. The curious smiling faces, thought by many to be a portrait of king Jayavarman VII himself or a combination of him and Buddha, are an instantly recognizable image of Angkor. Built in the 12th century by King Jayavarman VII as part of a massive expansion of his capital Angkor Thom, the Bayon is built at the exact center of the royal city. Angkor Wat (meaning “City Temple”) is the most magnificent and largest of all Angkor temples and the top tourist attraction in Cambodia. 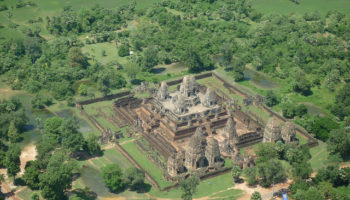 Built around the first half of 12th century by King Suryavarman II, the temple’s balance, composition and beauty make it one of the finest monuments in the world. A huge rectangular reservoir surrounds Angkor Wat which rises up through a series of three rectangular terraces to the central shrine and tower at a height of 213 meters (669 feet). This arrangement reflects the traditional Khmer idea of the temple mountain, in which the temple represent Mount Meru, the home of the gods in Hinduism. 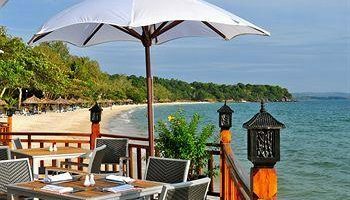 Which attractions in Cambodia do you consider to be the most interesting? 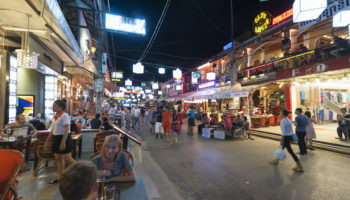 We went on Business Investment Trip to a few of these location in Cambodia – Ankor Watt tops the list for us! Great post, there’s so much cool stuff to see in Cambodia, and the people/culture are very special indeed 🙂 Nice to see Koh Ker in there too, one of the lesser known temples. 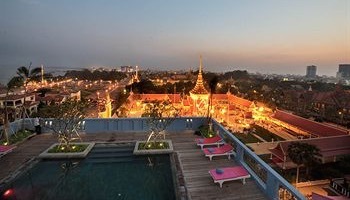 Cambodia tourism is booming and the country is becoming one of “the” travel destinations in Asia. 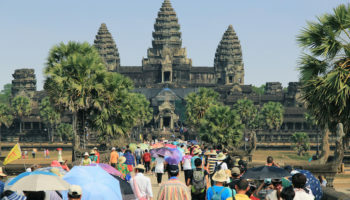 Now, more and more people become aware of the charms that the Khmer empire and the Cambodia tourism infrastructure have to offer visitors. 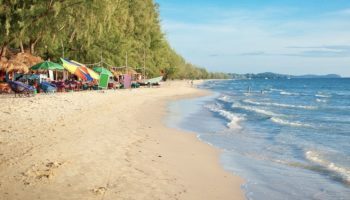 Going to Cambodia next year seems like is safe for all visitors. Many wonders to see. Cambodia here we go. Any nice and convenient hotels for two weeks which might had all inclusive? 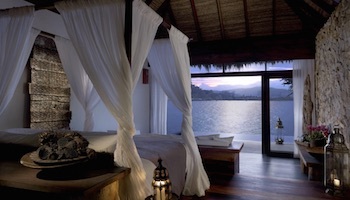 For those going to Cambodia I would recommend Kampot. Charming little town that feels off the Beaten Path. I’ve been to Cambodia twice to see Angkor Wat and this year in December I plan to go again. I was at Angkor Wat temple in June of 2016. It was absolutely amazing and beautiful. 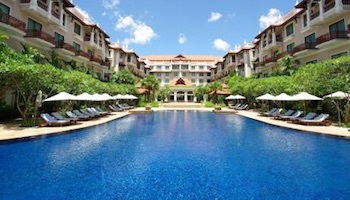 I recommend this destination for anyone that is going to the Siem Reap area. For me, the most amazing and beautiful place in Cambodia is Ratanakiri Province. It’s so natural still. The main attraction there is Yeak Laom Lake, crater lake, located in 4000 years old volcano crater. Water is crystal clear and much colder so it’s a great place for swimming and longer relax. From the Yeak Laom Lake, there is a road to Ou’Sean Lair Waterfall (one of the biggest waterfalls in Cambodia) and two other waterfalls Katieng and Kachanh. At Katieng waterfall living also elephants. Ratanakiri Province, it’s also a place where we can find Zircon mines. The weather is colder so it’s a great place for longer relax.